I’m sure most people have heard of Twitter. Many teachers have created an account (it’s free) at a PD session or conference at some point. But often we forget about it or say that we are too busy to spend time sifting through streams of information for useful ideas. The truth is that Twitter, like any social network, can be a major time drain. However, a few key strategies can help you ease into it and start to make it worth the time and effort. Really, Twitter allows you to curate and collect only information that you will find useful. And MANY, MANY educators use it regularly to learn and to share their learning. And if you are seeing irrelevant posts in your Twitter feed, simply unfollow those people or organizations. First, you don’t need to tweet at all if you don’t want to. You can simply watch/listen/read to what others are saying/posting. It can be useful to retweet ideas, links, and sources that you want to collect and revisit at some point. In this way Twitter can be a microblog of thoughts and resources that you agree with and want to explore further. It doesn’t matter if you have followers. You can simply use Twitter to feed your own professional development. Using hashtags(#) is a way to sift through Twitter to find out what people are saying about a topic and to join in if you want to. Inserting a hashtag into your tweets also will connect you to others having an asynchronous conversation. The great thing about #hashtags is that you don’t need to know some official list. You can make them up as you go. However, you will see common hashtags in others’ posts and then start to use them. Here are some frequently used education hashtags: #pyp, #pypchat, #ibdp, #edtech, #edchat, #pbl, #UbD, #engchat, #scichat, #mathchat, #litchat. Another possibility is to create a Twitter List based on a group or topic you would like to follow. I have created a public list called AASMoscow Tweets, containing connections to the AAS faculty who I know are at least occasional tweeters. You can subscribe to this list to follow the ideas and postings of other AAS faculty. If you don’t see yourself on this list, please tweet to me @PaulJCarpenter so I can add you. And remember to use @AAS_Moscow when referring to AAS. 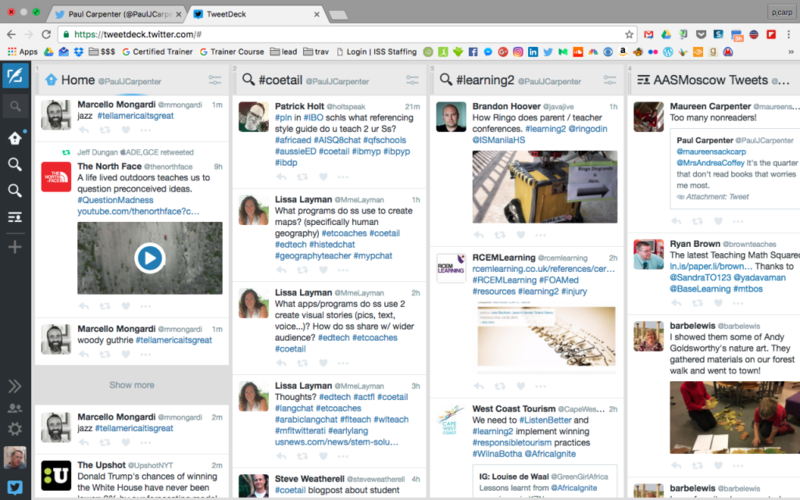 TweetDeck and other similar tools allow you to focus only on following specific streams. It allows you to follow a certain hashtag or a certain list of people, such as the AASMoscow Tweets list. This entry was posted in Professional Development and tagged PD, PLN, TweetDeck, Twitter by Paul Carpenter. Bookmark the permalink. Any recommendations on World Language people to follow? I’ll do some research and add some. For now, https://twitter.com/aatfrench looks like a good one to start with for French. I clicked through some of the followers and retweets and saw a number of French teachers who are posting regularly. This one in particular looks great to follow; she’s techy too: https://twitter.com/CatherineKU72. Follow her, watch who she retweets and links to!